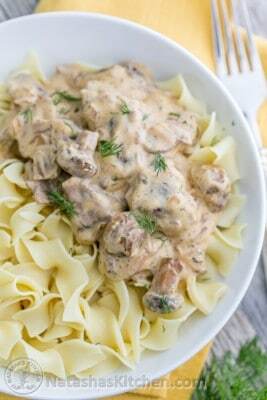 Using a slow cooker to make the classic beef stroganoff is easy and produces very tender and flavorful meat. Cut up any large pieces of stew meat. Heat oil in a large skillet over med/high heat. Brown meat in 2 batches in the hot oil. Drain off fat. In a 3 1/2 or 4 qt slow cooker, combine mushrooms, onions, 2 garlic cloves, 1/2 tsp thyme, 1/4 tsp salt, 1/4 tsp pepper, 1/2 tsp paprika, and 1 bay leaf. Add browned meat then pour beef broth and sherry over all. Cover and cook on low 8-10 hours or on high 4-5 hours. Meat will be tender. Remove and discard bay leaf. (If using low heat setting, turn heat to high) In a medium bowl, whisk together 8 oz sour cream, 1/3 cup flour, and 1/4 cup water until smooth then stir in about 1 cup hot liquid form the slow cooker. Return to the slow cooker and stir to combine. Cover and cook for another 30 min on high until thickened and bubbly. Just before serving, stir in fresh dill. Serve over warm egg noodles and sprinkle with additional snipped fresh dill.